It must finally be summer in Seattle. There just isn’t much time for sewing and it’s too sunny for photos. 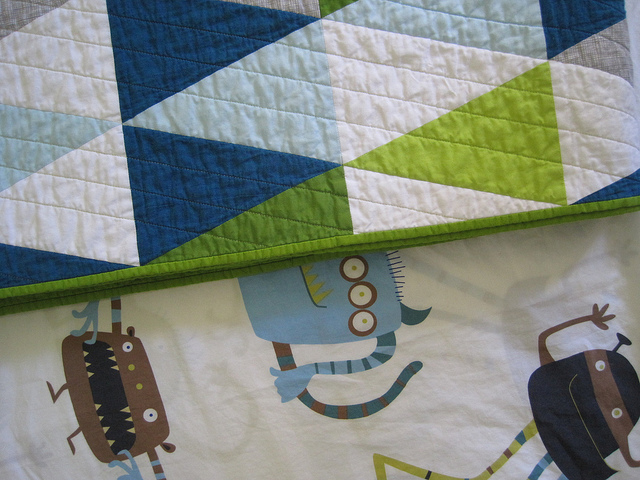 But with Roan’s birthday here and gone, that unfinished quilt was calling my name. 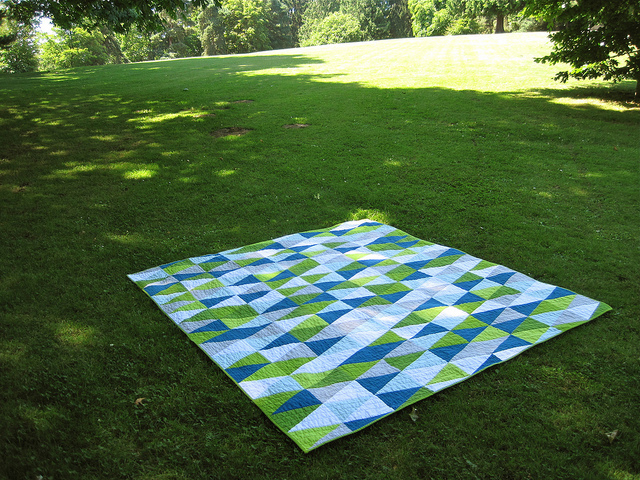 I went with the same triangle quilting I did on the original Unknown Direction, but used citron and blue thread. 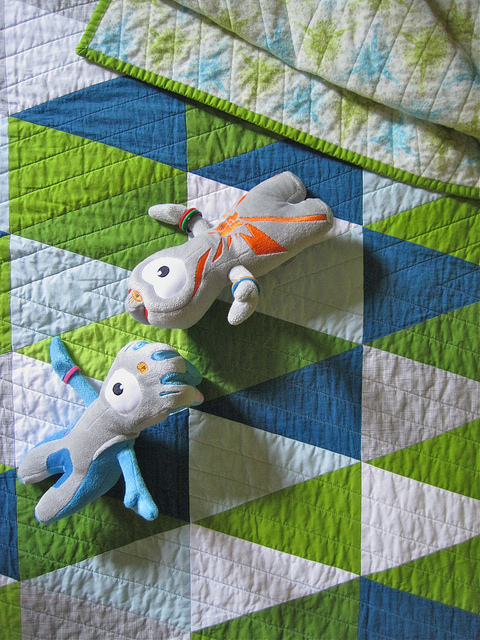 This time I spaced the quilt lines out a bit and was so happy I did since it took a load of time. 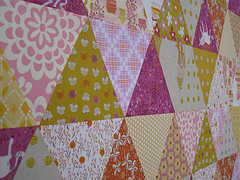 I stitched in the ditch to form the first large triangle in the middle and used masking tape to mark out from there. To make sure quilting lines didn’t get out of hand, I would restart my measuring from the next stitch in the ditch line. I made two quilt backs for this quilt before settling with a solo print. I’m not sure where the lesson is in that, except maybe now I have two new quilt tops. I bought the Anna Maria Horner flannel with this quilt in mind and it has got to be the softest flannel I’ve ever purchased. Good thing since I went overboard when I found the line on sale. 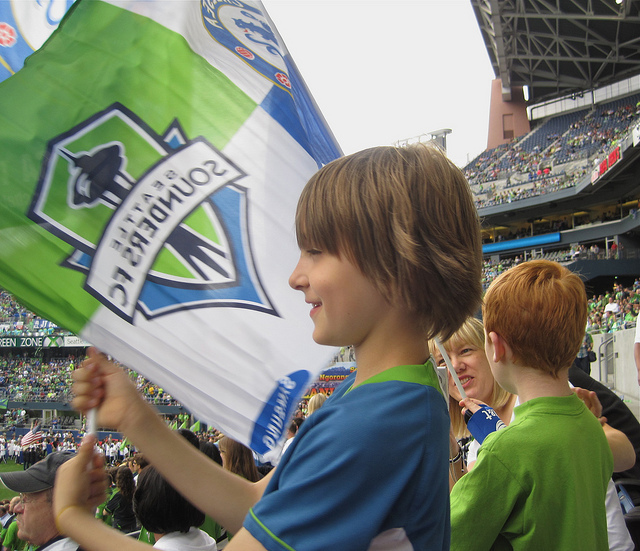 Color inspiration came from these vicious little monsters that Roan sleeps under and the colors of the Sounders FC uniforms. Have you found the pace of your sewing to slow in the summer? Maybe I’m not thinking so much of curling up on the couch under a quilt with a cuppa tea? gorgeous quilt!!! in such lovely pictures! Love it! Very cool and refreshing colors. Anything cool is a plus around Colorado with the high temps we’ve been having here. This quilt is so amazing! Your points just beautiful. Is this quilt in your new book? Is it something a confident beginner could do? Wow, thins is one of theost striking and lovely quilts Ive seen. It’s the colors. Your boys should be so happy. Thank you for showing your work. 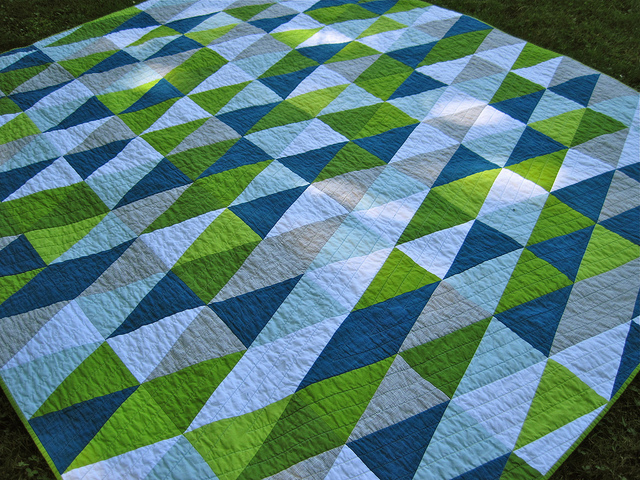 Gosh that quilting is gorgeous! I’m glad you’re getting some sun. I seem to remember you were shorted that recently =) And, yes, it’s too sunny for photos here too! it is so beautiful, Katie! Love the colors! Solids with a fun print on the back is super fun. Great work! It is really wonderful and the colors are perfect together. Great quilt and quilting ~ love the colors in this quilt. I’ve been having a heck of a time getting myself to sew anything. So irritating ~ it seems to come in little fits and spurts. I’m coming up to take the Flip Triangle class with you in late August ~ my son and dil are coming too ~ we’re making it a mini vacation (they won’t be taking the class). I’d love to take the triangle class to, but it’s a bit far for me ~ darn ~ cause I’d love to. Flip triangle and triangle class are the same class! I should change that. See you in August! I asked the same question a while back and found that a lot of my readers sew more in the summer because they stay inside with the AC! I’m geography has something to do with that! Hi Katie, your quilts are lovely. I am new to quilting (a total beginner) and I bought your book for some guidance and ideas. It’s beautiful and I’m looking forward to getting into it, but I was hoping the Unknown Direction Quilt Take 2 would be in there somewhere. Please could you advise the best way to begin that design?? Thank you!! Thanks Gemma. Cut yourself a triangle template or purchase a 60 degree triangle template. The triangles fit together right sides together nicely. Don’t clip the tips! I’m sure there are many tutorials available if you google 60 degree triangles. To stabilize the fabric when working with triangles, spray starch or Best Press Starch Alternative is advisable? One is better than the other? Sure wish I lived closer to Seattle. Your work is amazing. 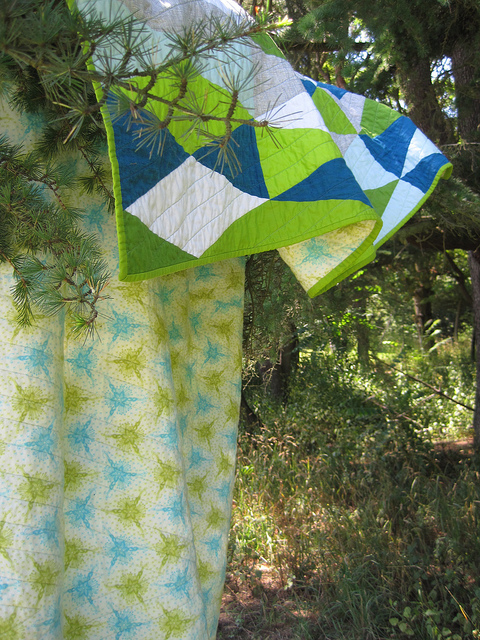 I tried to access your flipped triangles link, but it doesn’t work…..
Love this quilt and would love to try one.